An executive assistant serves as the assistant of the chief executive officer (CEO) or of the manager of any company. It is for this reason that company recruiters are often very picky when it comes to choosing an executive assistant. 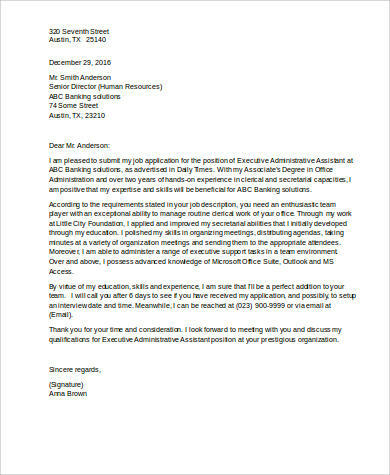 If you are planning to apply for an executive assistant job position, then it is not enough that you submit a stellar resume that depicts all your marvelous job experience, skills, and educational background; but it is also equally important that you attach a well-crafted cover letter with your resume. As brief and concise this document is, when written correctly, it packs a punch that will surely give your qualifications a boost! We have collected various executive assistant Sample Cover Letters for you to choose from. Scroll down below and start downloading! Can I Be an Executive Assistant? Works closely with the CEO to keep him/her well-informed of upcoming commitments and responsibilities and following up appropriately. 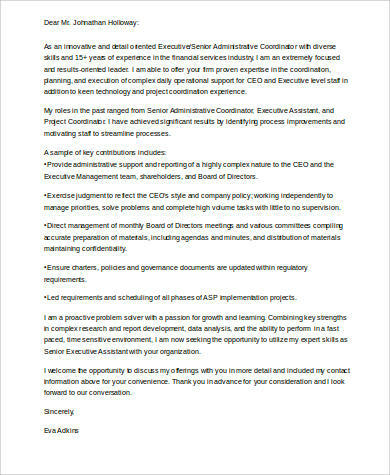 Completes critical aspects of deliverables with a hands-on approach if necessary, including drafting the acknowledgement letters, personal correspondence, and other tasks that facilitate the CEO’s ability to effectively lead the company. Prioritizes the more important business aspects in case there are conflicting needs; handles matter expeditiously, proactively, and follows through on projects to ensure its successful completion, often pressuring deadlines. Communicates directly and on behalf of the president and CEO with donors, staff, and others, on matters related to CEO’s programmatic initiatives. Provides a bridge for smooth communication between the president’s office and internal departments; demonstrating leadership to maintain credibility, trust, and support with senior management staff. Completes a broad variety of administrative tasks for the president and CEO. Coordinate with CEO on active calendar appointments. Complete expense reports to be presented to CEO. Compose and prepare correspondence that is sometimes confidential. Arrange detailed travel plans, itineraries, and agencies. Compile documents for travel-related meetings. Plans, coordinates, and ensures the CEO’s schedule is followed. 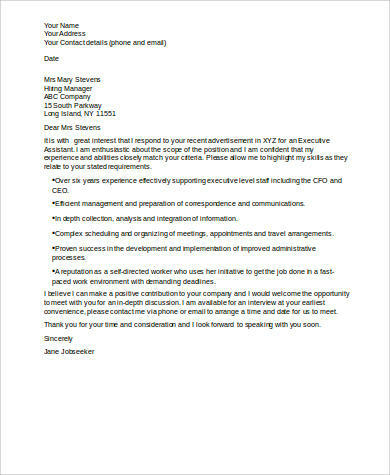 Aside from the ones that can be downloaded on this page, you can also refer to our collections of Executive Assistant Cover Letters and Marketing Assistant Cover Letters for your cover letter-writing needs. Simply click on their corresponding links. 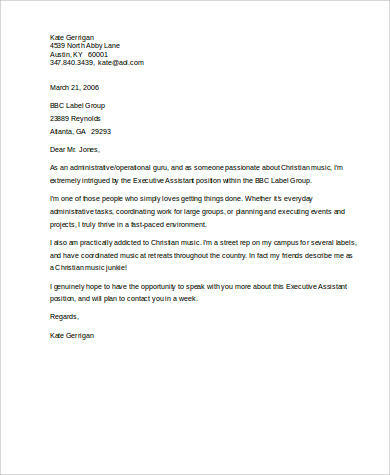 Why Submit a Cover Letter? A cover letter is a letter that is sent by a job applicant or job seeker to the hiring manager, recruiter, or prospective employer. 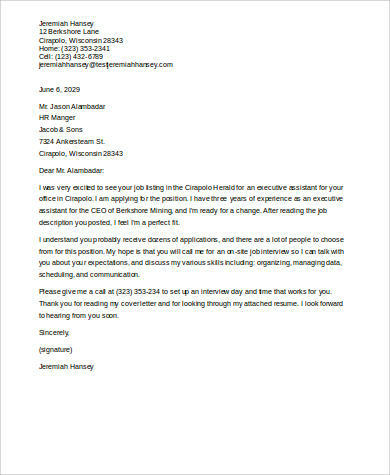 The purpose of this letter is to convince the letter-recipient that the job applicant is the best candidate for the job position he/she is applying for. 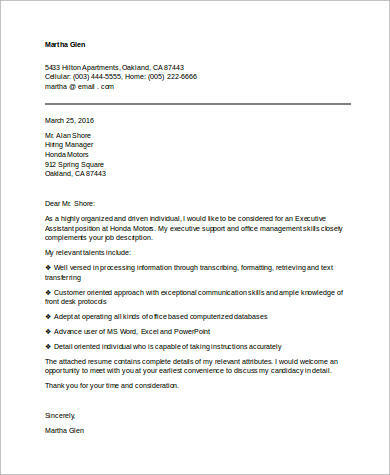 A cover letter allows you to elaborate more on your qualifications in carefully constructed sentences. The benefit of cover letters is that you are not in a hurry to impress the recruiter unlike in a job interview. You can take as long a time as you need to consider carefully which qualifications or aspect of your character that are worthy of mentioning. Also, the words that you will use are also important. 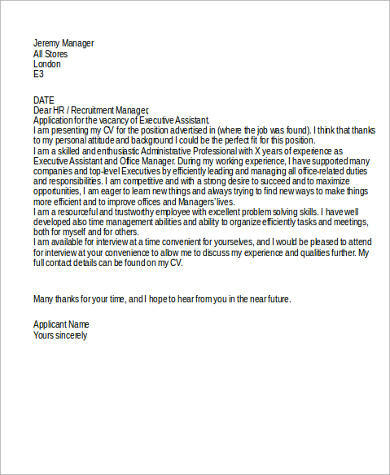 Now that you know how important cover letters are, you can start writing one now by basing it on our templates. Also, if you want more reference, you can check out our Sample Cover Letters for Medical Assistant or scour our website for more.